Analysis Of NPR's Coverage Of Transgender Issues, HB2, And Beyond : NPR Public Editor Listeners raise questions about NPR's coverage of the HB2 controversy. A gender neutral sign is posted outside a bathrooms at Oval Park Grill on May 11, 2016 in Durham, North Carolina. North Carolina Gov. Pat McCrory signed House Bill 2 — far-reaching legislation that limits civil rights protections for LGBT people and requires people to use multiple occupancy public restrooms that correspond to the gender on their birth certificate — on March 23. Since then, NPR's newsroom has made a concerted effort to approach thoughtfully the ensuing debate, which has largely focused on "Transgender Rights, The New Focus In The Culture Wars," as the headline on Debbie Elliott's May 11 Morning Edition piece summed it up. Standards editor Mark Memmott has issued four "memmos" on how to approach the coverage and what language to use; they can be read here. "I'm sad to say that it was almost the last straw this morning when you interviewed a supposed ally from a civil rights group who referred to transgender as a 'sexuality.' Transgender is not a sexuality. I know gay, straight, and bisexual transgender people. Being transgender has nothing to do with one's sexuality. Please, if you are going to interview allies, make sure they are informed allies. Make sure they speak for us. Better yet, please please PLEASE speak to some actual transgender people about what they are experiencing. A number of folks have spoken out and protested in NC. Speak to them. Speak to the lawyers of the young man in Virginia who has won the right to use the restroom matching his gender identity. Speak to people who will provide the facts," about whether transgender individuals have been charged with lewd acts in public restrooms and the danger to transgender individuals who use such facilities. NPR cannot control what its guests say, although misinformation should ideally, indeed, be corrected along the way. As to the facts, Jeff Brady's Weekend Edition Sunday piece attempted to get at them, citing some preliminary research that "extending public accommodations rights to transgender people" does not appear to lead to more crimes by predators, and that transgender people and non-gender conforming people themselves are at some risk in restrooms. I asked senior national editor Vickie Walton-James to respond to the numbers. She made the point that some of the pieces on the list were conversations between NPR hosts and reporters, with no outside voices at all, and many of those were covering breaking news. The 17 pieces on the list that came from the National Desk contained 11 transgender voices and a Monday All Things Considered story from Joel Rose about New Jersey's anti-discrimination law, that was not counted in the numbers, included four transgender voices. "The National Desk is working hard to include a diversity of voices in our coverage of this issue and I think we're succeeding," she wrote in an email. "Our stories have contained lawmakers who voted for HB2, those who didn't, members of North Carolina's transgender community, people living in big cities and tiny, rural communities. We've taken the story out of North Carolina, of course, especially with the Obama Administration's recent guidance." She also pointed to other recent stories from the National Desk, not related to HB2, including one about a church that welcomes transgender people, many of them homeless youth. "Each of these pieces takes seriously the experiences of transgender people," she wrote. "This debate will be with us for some time. And we'll continue to have diverse coverage." "I'm sure Sharp and his supporters were delighted with NPR giving them an unfiltered platform. But I expect more than simplistic journalism from NPR. Is Sharp's view justified? He claims to represent many families. Did NPR meet any of them? How did the transgender students view the situation? What did they think of Sharp's words? Are the transgender students justified in their view? This piece is an astonishing failure of NPR to get the whole story. I don't want my NPR to be a mouthpiece for extremists." Listener Kinney also wrote with concerns about the April 10 Sharp interview. As I responded to him then, "For better or worse, NPR tends to deal with multiple perspectives on an issue in separate interviews, sometimes strung out over a couple weeks." (I also pointed him to the counterpart perspective that ran earlier.) I understand why listeners find NPR's approach unsettling; not every listener can hear every interview. "My concern is that by framing our aim as to be able to get 'the bathroom of our choice' feeds into the mindset that being transgender is a choice. While the right wing may make this claim, medical and scientific current research posits a range of potential causes, from the genetics of the brain to prenatal exposure to a certain cocktail of hormones. Regardless of which of these explanations winds up being the correct one, no peer-reviewed research published by a credible scientific organization states that being transgender is a choice." I understand that there [are] a lot of mixed messages out there about what is the 'right' way to talk about transgender rights. I certainly wouldn't expect you to not publish that the right-wing are claiming that we want 'the bathroom of our choice': but it should be expressly framed in that way rather than written as if that's our way of framing it or an objective truth." Abby Jensen, "a transgender woman, attorney, activist and vice president and general counsel of the Southern Arizona Gender Alliance," wrote, "In fact, what we want is the right to use the restrooms and other facilities that match our gender identity, just as all non-transgender people are allowed to do; in other words, equal rights, not special rights. (Everyone has a gender identity, just as everyone has a race and a sexual orientation.) By using the word 'choice,' NPR feeds into anti-LGBT arguments that being transgender is merely a 'lifestyle choice,' and therefore not worthy of respect or consideration." NPR has indeed used the word "choice" a number of times, but in response to the letters, standards editor Memmott today issued new guidance to the newsroom that "choice" is to be avoided. He wrote: "We look for neutral language. 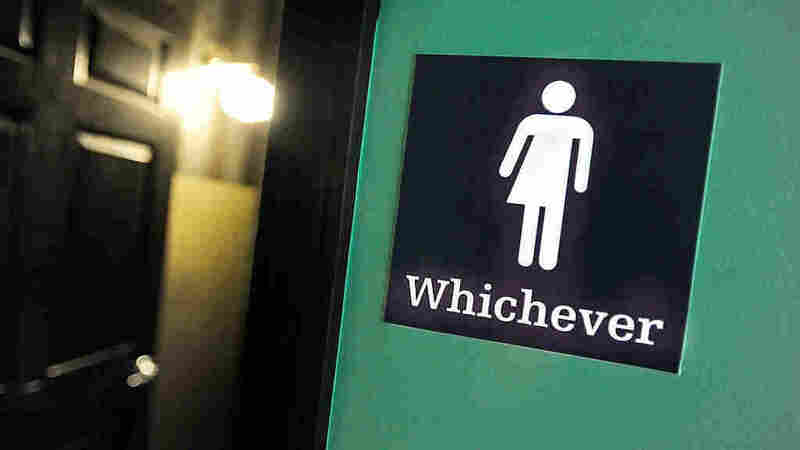 One way to talk about this subject is to say it's a debate over whether transgender people should be allowed to use public bathrooms 'based on their gender identities or, instead, what's stated on their birth certificates.'" Finally, I have received a couple of letters from listeners who think NPR is devoting altogether too much time to the issue (which was the subject of the first hour of both On Point and The Diane Rehm Show today, as well as 26 pieces on the morning and evening newsmagazines since May 9, through this morning.) One NPR listener from Temple Hills, Md., who did not give a full name, wrote, "There are rampant energy issues, a faltering infrastructure, a U.S. economic recovery that has left the patient with significant lasting deficiencies," adding, "The incremental enlightenment — or impediments to same — regarding rules for human beings relieving themselves really doesn't warrant so much air time." As Elliott's piece made clear, this is more than a simple debate over bathrooms, and NPR has not ignored other issues — it has still found time for plenty of Donald Trump news as well as a superb report this morning about continued delays to see a doctor at Veterans Affairs clinics. But what do you think? Has NPR spent too much time on this topic? This post has been updated to include a response from Vickie Walton-James.